On October 28, 2003, Battalion Chief John Michelini is assigned as the Structure Group Supervisor for the Julian Structure Group. 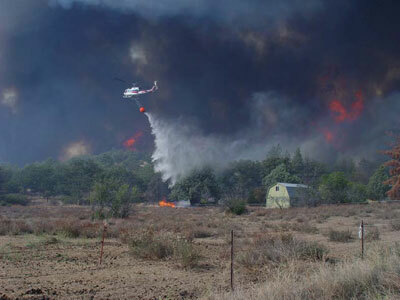 According to Michelini, throughout the day, units are deployed in and around structures south of Highway 78/79. He observes that at about 5:00 p.m., the fire’s northern spread has been stopped between Pine Hills Road and Wynola. 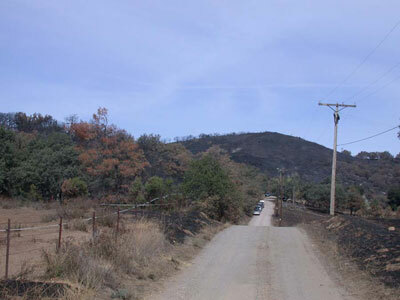 Open line continues to burn between Wynola Estates and Santa Ysabel below Highway 78/79. By late afternoon, the Cedar Fire, under an onshore wind influence has burned northeast up the San Diego River drainage to just southwest of Highway 78/79. S/T Leader Keating notes that the fire is already at the bottom of the canyon but has not burned clean. 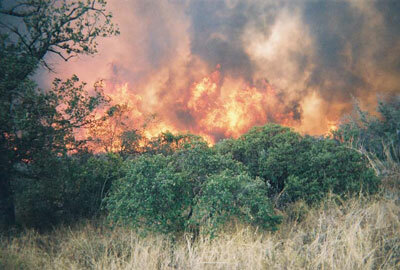 He requests that Michelini come to his location and confirm what he wants before they put fire on the ground. While waiting for Michelini, Keating is joined by S/T Leader Allen Chandler and Strike Team 1624C. 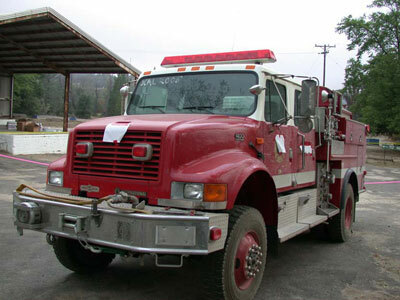 This is a mixed strike team mostly of U.S. Forest Service engines. S/T Leader Chandler tells Keating that he also has concerns about burning out this area. 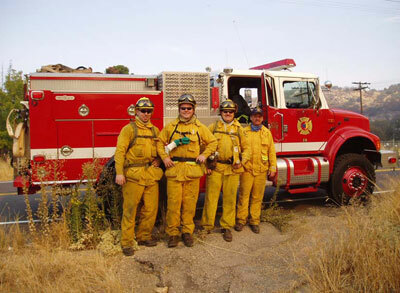 Engine 6162 crew at Santa Ysabel on the morning of Oct. 29, 2003; Left to right: Firefighter Barrett Smith, Engineer Shawn Kreps, Engineer Steve Rucker and Captain Doug McDonald. 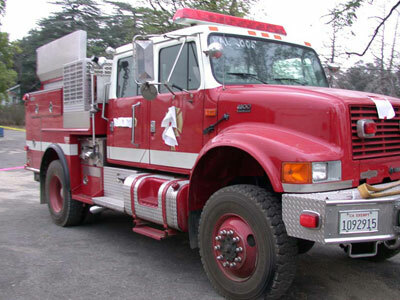 Strike Team 2005A with Engine 6162 which is assigned to Branch III, Division I, arrives at Santa Ysabel at about 9:15 a.m.  At first, Strike Team Leader Jim Watkins cannot find anyone from Division I. According to rough estimates by Division I Runnestrand, and Pilot Hunter Ridenour, (Tactical map by Runnestrand in evidence, and drawing by Pilot Hunter Ridenour in Tab Section 57 of Attachments) by late morning the fire has crossed Highway 78/79 and is burning in a northern direction up the ridge on the west side of the San Diego River drainage. The fire has spread along this ridge about one half to three-quarters of a mile past Highway 78/79. 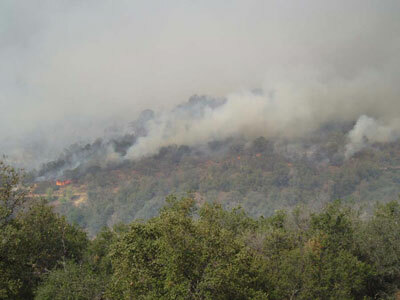 The fire is making short runs in the grass, brush and oak trees in the area during the late morning. 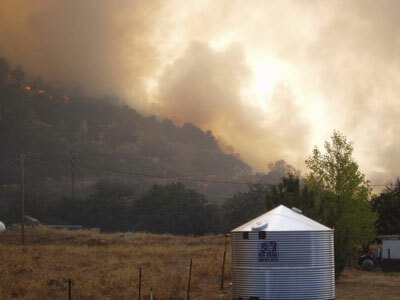 Slop-over Fire after it crossed Highway 78/79; viewed from Santa Ysabel by the crew of Engine 6162. Photo taken by Firefighter-Paramedic Barrett Smith at 9:47 a.m. on 10/29/03. When Firefighter-Paramedic Smith  and Engineer Kreps , arrive in the Riverwood Estates, the find that the area around the structures has been fired-out and begin mop-up operations. Both watch as the fire burns to the west in the distance where the fire has jumped the highway and is now northwest of Highway 78/79. The fire is calm in the Riverwood Estates area. While the crew of Engine 6162 is doing structure protection in the Riverwood Estates, Captain McDonald has a discussion with members of the crew, including Engineer Rucker, concerning the use of hose packs. Captain McDonald states that if there is a need to protect the structure, they will extend the deployed hose lines with the first 100 feet of a 200 foot wildland hose pack.94 According to the apparatus inventory, these packs are located in the rear compartment of Engine 6162. Engine 6162 driving through the slop-over area on Highway 78/79. Looking west from Riverwood Estates towards the slop-over above Highway 78/79 at 10:56 a.m. on October 29, 2003. 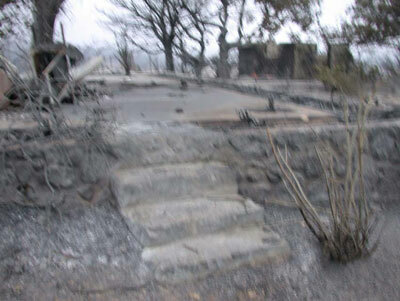 Photo taken by Firefighter-Paramedic Barrett Smith. 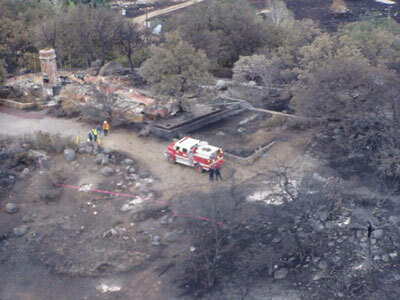 During this time, the fire on the west side of the drainage has moved up-canyon and gained elevation. Coming under the influence of a west wind running perpendicular to the ridge top, the fire higher in the drainage spreads to the northeast. Burning to and past the northeast corner of the property located at 902 Orchard Lane and leaving spot fires near the southeast flank. The fire has now established itself on the eastern side of the drainage in a hooking move to the northeast. S/T 2005A is grouped up again to begin its move towards the Orchard Lane area. Engine 24, still at the house about one quarter mile north of Riverwood Road on Highway 78/79, observes that the fire has almost burned down to the highway. At this time, the strike team drives by and Engine 24 falls into line behind them. Engine 334 goes to a hydrant to top off its tank. Post fire view of Orchard Lane looking north. Vehicles parked on side of the road are located just to the south of the driveway at 930 and 920 Orchard Lane. Captain McDonald on Engine 6162 orders his engine backed up to get to a better location along the road due to the fire activity he sees ahead of them. The other units of the S/T back up with them. The Crew of Engine 6162 identifies the fields to the east as a safety zone. Because it is the first strike team assignment for Engine 1541, S/T Leader Watkins assigns them to a large metal building at 915 Orchard Lane, on the east side of the road. They take up a position to protect this farm building which is said to have pesticides stored in it. Looking up the driveway at 920 Orchard Lane from its intersection with Orchard Lane. S/T Leader Watkins sees FC Childe walk by and hears him say, “you need to start puttin’ fire down on the ground or you’re gonna start losin’ houses.”  Engine 334 calls S/T Leader Watkins and advises him of the instructions from FC Childe. FAE Sanchez continues to light fire from the driveway at 920 Orchard Lane towards the driveway at 902 Orchard Lane. Alone, FC Childe in the utility returns to the bottom of the driveway at 920 Orchard Lane.64 Both FC Childe and FAE Sanchez deny having been up this driveway or having fired-out in this area. Picture taken by Engineer Kreps of the fire he finds on the ground north of the garage just before he begins to fire-out from this location. This is the same area where Capt. McDonald sees two CDF personnel firing-out at the top of the driveway. View is to the north towards 902 Orchard Road. 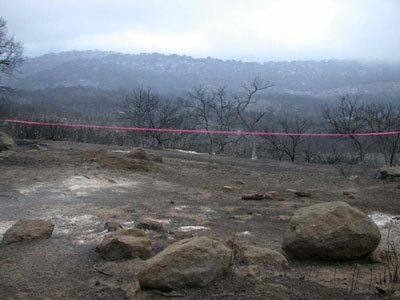 Area below and to the southwest of Engine 6162 where brush had been cleared and the crew of Engine 6162 strip-burned grass stubble. Capt. McDonald had thrown fusees into brush below the clearing. S/T Leader Watkins sees signs of the fire picking up but still believes it to be from the northwest, the direction he has always thought it would come from. It is at about this time that he begins to hear the fire. Main fire running from southwest to northeast. Viewed from Orchard Lane near 1038 Orchard. Flames on the right in background are near 930 Orchard Lane. Fire picking up below the crew of Engine 6162 just as they begin to retreat back to the engine from firing-out. Photo taken by Engineer Kreps. The crew of Engine 6162 gathers at the engine to talk. As the fire intensity increases, the crew decides to retreat to the passenger side of the engine away from the radiant heat below them. Firefighter-Paramedic Smith staffs a one and one-half inch hose line at the front passenger side while Engineer Rucker staffs a similar hose line near the rear passenger side. Engineer Kreps is standing at the rear duals on the passenger side with his back to the engine. Picture taken by Engineer Kreps as he steps out from behind the cover of the passenger side of the engine. Steps which the crew members used to get up onto the patio. Physical evidence located at the top of the steps, including a gated-wye, fusees, hose spanner, and flagging from pouches attached to the web gear of Captain McDonald, indicate that Captain McDonald’s web gear was failing at this time and equipment was falling off. This was most likely due to burning of the web gear and pouch. No member of the crew has any recollection of Engineer Rucker having a wildland hose pack on, and Captain McDonald has no recollection of instructing Engineer Rucker to don a hose pack at this time. However, physical evidence recovered from and around the body of Engineer Rucker clearly indicates that he had a 200 foot, one and one-half inch wildland Gnass hose pack on his back. These packs are located in the middle rear compartment of Engine 6162. An inventory of the engine after the accident shows that one 200-foot wildland hose pack is missing from this compartment. Burnt outline of first 100 feet hose pack dropped near the feet of Engineer Rucker on patio. In-line Tee visible in upper middle portion of photo. Physical evidence at the scene shows that as Captain McDonald and Engineer Rucker crossed the patio, the first 100 feet of the hose pack fell to the ground and burned without having been deployed fully. 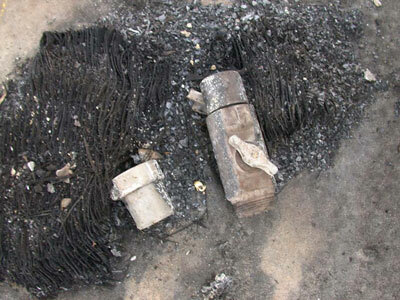 It cannot be determined if this was due to an intentional deployment or failure of the hose pack. 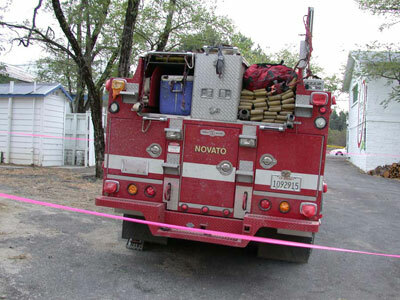 A King portable radio belonging to the Novato Fire District is later found on the ground next to the body of Engineer Rucker on the side nearest the steps. 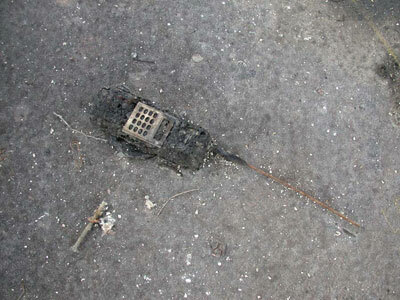 This radio had been carried by Captain McDonald and was being used to transmit on the tactical channel. Captain McDonald has no recollection of making a radio transmission next to Engineer Rucker at this point in time. Captain McDonald states that he “turned like 180 degrees trying to yank him (Engineer Rucker) up.”  This is consistent with the physical evidence found at the scene indicating that the second 100-foot bundle of hose from the hose pack had been pulled away from Engineer Rucker in the 180-degree direction described by Captain McDonald, towards the rear of the patio. Second 100 feet of hose pack found just above and next to the right shoulder of Engineer Rucker. The fire has reached the ridgeline and is being funneled across the ridge to the east. 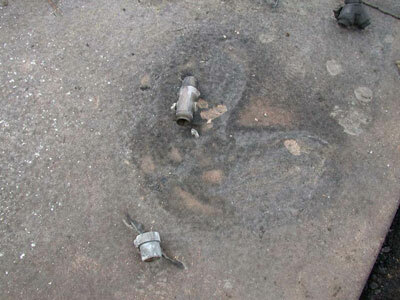 Physical evidence recovered at the accident scene indicates that fire impinging upon the charged hose lines coming off the rear of the engine causes the hose to fail and the engine tank is pumped almost dry. View from near the rear door of the residence looking toward the patio. 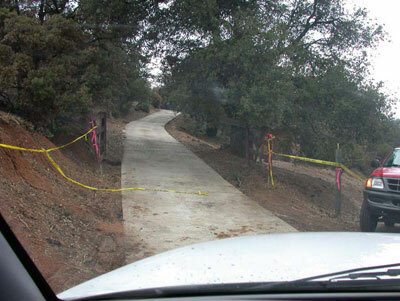 This is the path taken by the crew after turning the corner from the patio, and the route used to return to look for missing crew members. Tree located in upper right corner of photo is next to the location where Engineer Rucker went down for the third and final time. Photo taken after the accident with Engine 6162 placed back into position of where it was during the burn-over. The Engine is facing north. Fired-out area shown in lower left corner of photo. Steps used to access patio are just north of the engine. Engineer Rucker’s body was found just below tree on patio. Engine 6162 is successfully driven to the bottom of the driveway and onto Orchard Lane. 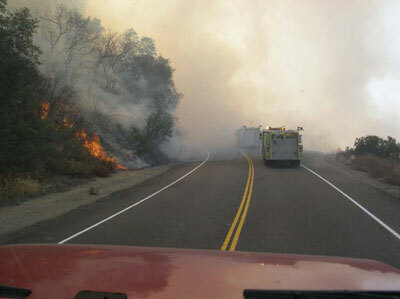 S/T Leader Watkins, only 25 to 30 feet from the end of the driveway and in heavy smoke, does not see the engine leave. Engine 6162 travels down Orchard Lane to the south. At 1:09 p.m.,  Captain McDonald again makes a radio transmission on Command Net to other units concerning the incident. Captain McDonald orders the engine to stop in the road and he gets out. The crew members assist him back into the engine. They continue towards Highway 78/79. At 1:10 p.m., the three crew members of Engine 6162 arrive at the south end of Orchard Lane just short of Highway 78/79 where they found the Plumas Hotshots. The three crew members of Engine 6162 exit the engine and announce to the Plumas Hotshot crew that they have been burned. 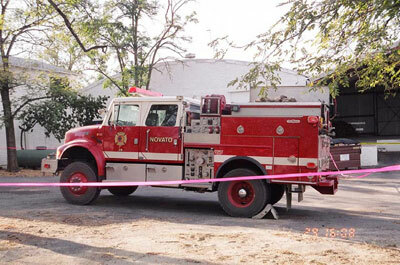 Engine 6162 at initial medical treatment area at 3:08 p.m. on Oct. 29, 2003. Note the time stamp on the photograph is one hour ahead of the correct time. The Plumas Hotshots are staged at Hwy 78/79 and Orchard Lane at approximately 1:00 p.m. They hear radio traffic about an engine burn-over and firefighter injuries. The Sheriff Deputies bring the patient of the vehicle accident to the Julian Fire Station at about 1:08 p.m. Julian Fire Paramedic Chris Yeary initially treats this patient. While packaging the vehicle accident patient, Paramedic Yeary is told about firefighters being burned. Paramedic Yeary requests that the backup Julian Fire Department Ambulance respond to this location to treat the victim of the vehicle accident. The vehicle accident patient was reported to be an out-of-state volunteer firefighter who was assisting in the fire fighting efforts. Mercy Air Flight transported the victim to the hospital. At about 1:10 p.m., Engine 6162 arrives at the intersection of Orchard Lane and Highway 78/79. They advise the Plumas Hotshots there that they are the engine crew that was burned-over. The Plumas Hotshots triage the patients and administer medical assistance to the injured firefighters. Advanced Life Support (ALS) ambulances and medical helicopters are requested. Captain McDonald is triaged as the most severely injured with 1st, 2nd, and 3rd degree burns. Captain McDonald is in need of immediate ALS intervention. Prior to being treated for their own burns, Engineer (Paramedic) Kreps and Firefighter-Paramedic Smith from Engine 6162 use the ALS equipment from their engine to start two IVs on Captain McDonald. Engineer Kreps tells Cedar Incident Safety Officer John Simon that Engineer Rucker is an “1144” at the burn-over scene. Engineer Kreps states that Engineer Rucker was fully involved in fire when he last saw him. At approximately 1:27 p.m., the first Julian Paramedic Ambulance with Paramedic Yeary arrives at Engine 6162’s location. Captain McDonald is packaged and transported to a landing zone. CDF Copter 202 transports Captain McDonald and Paramedic Valentini to Ramona Airport to rendezvous with a Mercy Air Helicopter at about 1:52 p.m. Captain McDonald is transferred to the Mercy Air Crew and transported to the University of San Diego Burn Center. CDF Copter 406 transports Engineer Kreps and Firefighter-Paramedic Smith to Ramona Airport at 1:56 p.m. to rendezvous with a Mercy Air Helicopter. Paramedic Yeary treats Kreps and during the flight. At Ramona, Kreps and Smith are transferred to the Mercy Air Crew for transport to the University of San Diego Burn Center. 1. Written statement by John Michelini dated 11-02-03. See tab section 20 of Attachments. 2. Typed statement by Thomas Keating fax date of 11-03-03. See tab section 21 of Attachments. 3. Interview and written statement by Jim Watkins dated October 30-31, 2003. See tab section 24 of Attachments. 4. ICS 214 by Ray Chaney for operational period of October 29, 2003. See Tab section 17 of Attachments. 5. Typed statement by Ray Sauceda. See tab section 56 of Attachments. 6. E-mail from Roger Raines on documenting telephone interview with Michelini and Chandler on November 25, 2003. See tab section 22 of Attachments. 7. Tape-recorded interview with Dan Runnestrand on November 2, 2003. See tab section 23 of Attachments. 8. ICS 214 by Jim Watkins for operational period of 10/29/03. See tab section 24 of Attachments. 9. Tape recorded interview and written statement by Jim Watkins. See tab section 24 of Attachments. 10. Tape recorded interview with John Childe on October 31, 2003. See tab section 50, page eight and 46 of Attachments. 11. Tape recorded interview with John Childe on October 31, 2003. See tab section 50, page 12 of Attachments. 12. Tape recorded telephone interview with Mike Wakoski. See tab section 18 of Attachments. 13. Tape recorded interview with John Childe on October 31, 2003. See tab section 50, page 46 of Attachments. 14. Tape recorded interview with Jim Watkins on October 31, 2003 See tab section 24, page 29 of Attachments. 15. Tape recorded interview with Dan Runnestrand on November 2, 2003. See tab section 23, page 15 of Attachments. 16. Tape recorded interview with Smith on October 30, 2003. See tab section 27, page 12 of Attachments. 17. Tape recorded interview with Shawn Kreps on October 30, 2003. See tab section 28, page 11 of Attachments. 18. Written statement by Captain Michael Carpenter, Vallejo Fire Dept. dated 10/30/03. See tab section 36, page one and two. 19. Tape-recorded interview with S/T Leader Watkins. See tab section 24 of Attachments page 19. 20. Tape-recorded interview with Dan Runnestrand in tab section 23 of Attachments page nine. Also mentioned on ICS 214 of Mike Wakoski in tab section 18 of Attachments. 21. Tape-recorded interview with Hunter Ridenour. See tab section 57 of Attachments. 22. Tape-recorded interview with Ron Mitchell. See tab section 44 page three and four of Attachments. 23. ICS 214 for Oct. 29, 2003, by Capt. Carpenter showing arrival at assignment at 1068 Orchard Lane at 11:57 a.m. See tab section 36 of Attachments. 24. Tape-recorder interview with S/T Leader Watkins. See tab section 24, page 24 in Attachments. 25. Tape-recorded interview with S/T Leader Watkins. See tab section 24, page 26 in Attachments. 26. Tape-recorded interview with FC John Childe. See tab section 50, page 14 of the Attachments. 27. Tape-recorded interview with S/T Leader Watkins. See tab section 24, page 37 of the Attachments. 28. Tape-recorded interview with S/T Leader Watkins. See tab section 24, page 28 of the Attachments. 29. Tape-recorded interview with S/T Leader Watkins. See tab section 24, page 27 of the Attachments. 30. Tape-recorded interviews with FF Smith and Engineer Kreps. See tab section 27, page 20 and tab section 28, page 13-14 of the Attachments. 31. Tape-recorded interviews with FF Smith, Engineer Kreps, Capt. McDonald, and S/T Leader Watkins. See tab section 27, pages 20-21; tab section 28 page 14-15; section 26, page 19 of the Attachments. 32. See S/T Leader Watkins statements and crew statements in tab sections 24, 36,37, 38, 39 of the Attachments. 33. Tape-recorded interview with FC John Childe. See tab section 50, page 16 of the Attachments. 34. Tape-recorded interview with FC John Childe. See tab section 50, page 51 of the Attachments. 35. Tape-recorded interview with FC John Childe. See tab section 50, page 16 of the Attachments. 36. Tape-recorded interview with S/T Leader Watkins. See tab section 24, page 29 of the Attachments. 37. Tape-recorded interview with FC Childe. See tab section 50, page 20 of the Attachments. 38. ICS-214 for 10-29-03, FC John Childe. See tab section 50, ICS-214. 39. Tape-recorded interview with FC Childe and ICS 214. See tab section 50, page 32, of Attachments and tab section 50, ICS-214 for 10-29-03 by FC Childe. 40. Tape-recorded interview with FAE Sanchez. See tab section 51, page 12 of Attachments. 41. Tape-recorded interview with FC Childe. See tab section 50, page 44 of Attachments. 42. Tape-recorded interview with FC Childe. See tab section 50, pages 21 and 38 of Attachments. 43. Tape-recorded interview with FC Childe. See tab section 50, page 53 of Attachments. 44. Tape-recorded interview with FC Childe. See tab section 50, page 19 of Attachments. 45. Tape-recorded interview with FC Childe. See tab section 50, page 51 of Attachments. 46. Tape-recorded interview with FC Childe. See tab section 50, page 26 of Attachments. 47. Tape-recorded interview with FC Childe. See tab section 50, page 27 of Attachments. 48. Tape-recorded interview with S/T Leader Watkins. See tab section 24, pages 29-30 of Attachments. 49. Tape-recorded interview with S/T Leader Watkins. See tab section 24, page 37 of Attachments. 50. Tape-recorded interview with S/T Leader Watkins. See tab section 24, page 38 of Attachments. 51. Typed statement by Capt. Carpenter of engine 24. See tab section 36 of Attachments. 52. Tape-recorded interviews with Capt. McDonald. See tab section 25, page three of Attachments. 53. Tape-recorded interviews with FF Smith and Engineer Kreps. See tab section 27, page 21 and tab section 28, page 15 of Attachments. 54. Tape-recorded interview with FF Smith. See tab section 27, pages 25-26 of Attachments. 55. Tape-recorded interview with FF Smith. See tab section 27, pages 21-22 of Attachments. 56. Tape-recorded interview with El Cariso Hot Shot Superintendent Jay Bertek. See tab section 52, pages 11-12 of Attachments. 57. Tape-recorded interviews with FF Smith, Capt. McDonald and Engineer Kreps. See tab section 26, page. five; tab section 27 pages 29-30; tab section 28, page. 18 of Attachments. 58. Tape-recorded interview with FAE Sanchez. See tab section 51, page. 11-12 of Attachments. 59. Written statement by Capt. Scofield on Copter 202, dated 11-02-03. See tab section 59 of Attachments. 60. Tape-recorded interview with FAE Sanchez. See tab section 51, pages 14-15 of Attachments. 61. Supplementary Investigation Report 0-4/c. See tab section 51, Supp. report by Alan Carlson. 62. Supplementary Investigation Report 0-4/d. See tab section 50, Supp. report by Alan Carlson. 63. Tape-recorded interviews with FF Smith and Engineer Kreps. See tab section 27, pages 30-31; tab section 28, pages 17-18 in Attachments. 64. Typed statement by Asst. S/T Leader McLaughlin. See tab section 25, page four of Attachments. 65. Tape-recorded interview with FAE Sanchez. See tab section 51, pages 17-20 of Attachments. 66. Tape-recorded interview with FC Childe. See tab section 50, page 65 of Attachments. 67. Tape-recorded interview with Capt. McDonald. See tab section 26, pages four, 14 and 15 of Attachments. 68. Tape-recorded interviews with FF Smith, Engineer Kreps, and Capt. McDonald. See tab section 27, pages 33; tab section 28, pages 21-23, 42 of Attachments. 69. Tape-recorded interview with S/T Leader Watkins and his ICS-214 for 10-29-03. See tab section 24, page 48 and ICS-214 last page, in attachment. 70. ICS-214 by S/T Leader Watkins. See tab section 24, last page of ICS-214 in attachment. 71. Tape-recorded interviews with Capt. McDonald, FF Smith, Engineer Kreps, and S/T Leader Watkins. See tab section 26, page 31; tab section 27, Pages 35-36; tab section 28, page 41; tab section 24 ICS-214 for S/T Leader Watkins. 72. Tape-recorded interview with S/T Leader Watkins. See tab section 24, page 49 of Attachments. 73. Tape-recorded interview with FC Childe. See tab section 50, pages 40 and 23 of the Attachments. 74. Tape-recorded interview with FC Childe. See tab section 50, page 23 of Attachments. 75. Tape-recorded interview with FAE Sanchez. See tab section 51, page 24 of Attachments. 76. 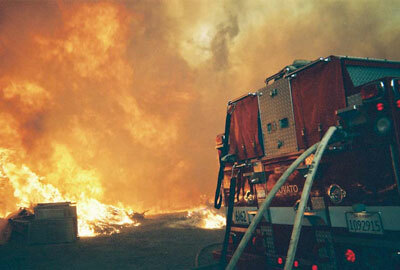 Written supplemental report by Kevin Johnston with the crew of engine. See tab section 36, supplemental interview first page, Attachments. 77. Typed statement of Capt. Carpenter. See tab section 36 of Attachments. 80. Tape-recorded interview with Ron Mitchell. See tab section 44, page five of Attachments. 81. Tape-recorded interviews with Capt. McDonald, FF Smith and Engineer Kreps. See tab section 26, pages 21-22; tab section 27, pages 38-39; tab section 28, pages 26-27 of Attachments. 82. Tape-recorded interview of Capt. McDonald. See tab section 26, page 6 of Attachments. 83. Tape-recorded interview of FF Smith. See tab section 27, page 38 of Attachments. 84. Tape-recorded interview of Engineer Kreps. See tab section 28, page 26 of Attachments. 85. Tape-recorded interview with FF Smith. See tab section 27, page 39 of Attachments. 86. Tape-recorded interview with FF Smith. See tab section 27, pages 39-40 of Attachments. 87. Tape-recorded interview with S/T Leader Watkins. See tab section 24, pages 53-54 of Attachments. 88. Tape-recorded interview with FF Smith and Engineer Kreps. See tab section 27, pages 41-42; tab section 28, page 27 of Attachments. 89. Tape-recorded interview with Capt. McDonald. See tab section 26, pages six through eight of Attachments. 90. Tape-recorded interview with S/T Leader Watkins. See tab section 24, pages 55-56 of Attachments. 91. ICS-214 from C. Marchisio, see tab section 90 of Attachments. Tape-recorded interview with S/T Leader Watkins. See tab section 24, page 56 of Attachments section. Written statement by Ryan Bauer. See tab section 86, page one of Attachments. 92. Tape-recorded interviews with FF Smith and Engineer Kreps. See tab section 27, pages 42-44, 46 and tab section 28, pages 27-28 of Attachments. 93. Tape-recorded interview with Capt. McDonald. See tab section 26, page 27 of first interview and McDonald second interview in tab section 26. 94. Second tape-recorded interview with Capt. McDonald. See tab section 26. 95. Tape-recorded interviews with FF Smith and Engineer Kreps. See tab section 27, pages 47-48 and tab section 28 pages 28-30 of Attachments. 96. Tape-recorded interviews with FF Smith and Engineer Kreps. See tab section 27, pages 48-50 and tab section 28, pages 31-32 of Attachments. 97. General Message form by Mike Brown. Time stamped on PDA. See tab section 75 of Attachments. Also on ICS-214 by Mike Brown. 98. Tape-recorded interview with S/T Leader Watkins. See tab section 24, page 58 of Attachments. 99. Written statement by Plumas Hot Shot FF. Ryan Bauer. See tab section 86, of Attachments. 100. Tape-recorded interview with S/T Leader Watkins. See tab section 24, page 59 of the Attachments. 101. Tape-recorded interview with S/T Leader Watkins. See tab section 24, page 60 of attachment. Tape-recorded interview with Brian Rhodes. See tab section 64, pages 8-9 of Attachments. 102. Typed statement by Fire Fighter Ryan Stewart, USFS Engine 39. See tab section 66, page two of Attachments. 103. Tape-recorded interview with S/T Leader Watkins. See tab section 24, page 62 of Attachments. 104. Tape-recorded interview with FC Childe. See tab section 50, pages 28, 29 and 44 of the Attachments. 105. Tape-recorded interview with FC Childe. See tab section 50, pages 42 and 43 of the Attachments. 106. Tape-recorded interview with FC Childe. See tab section 50, page 30 of the attachment. 107. Tape-recorded interview with Dozer Operator Jeff Vidrinskas. See tab section 54, page seven of the Attachments. 108. Tape-recorded interview with Jeff Vidrinskas. See tab section 54, pages 11-16 of the Attachments. 109. 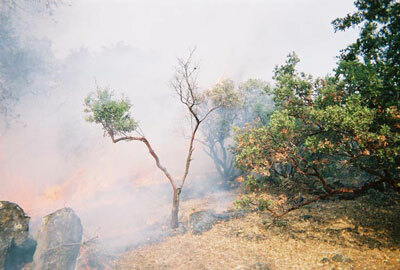 Refer to IAPs for the Cedar Incident, October 28th and 29th, 2003. See tab sections 202, 204, 205. 110. Supplemental interview with Captain McDonald dated Jan. 20, 2004. See tab section 26 of Attachments. 111. Tape-recorded interview with Fire Fighter Smith. See tab section 27, page 57 of Attachments. 112. Tape-recorded interview with Engineer Kreps. See tab section 28, pages 26-27 and 3637 of Attachments. 114. Video from John Childe. Evidence item 16P. Also see compilation copy of videos. 116. 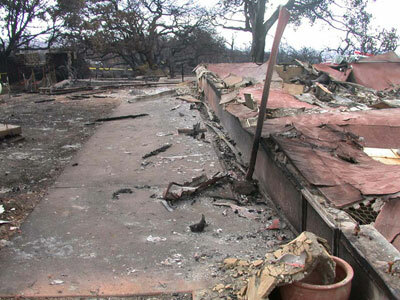 Fire Behavior Report and FARSITE Executive Summary. See tab sections 252, 253.